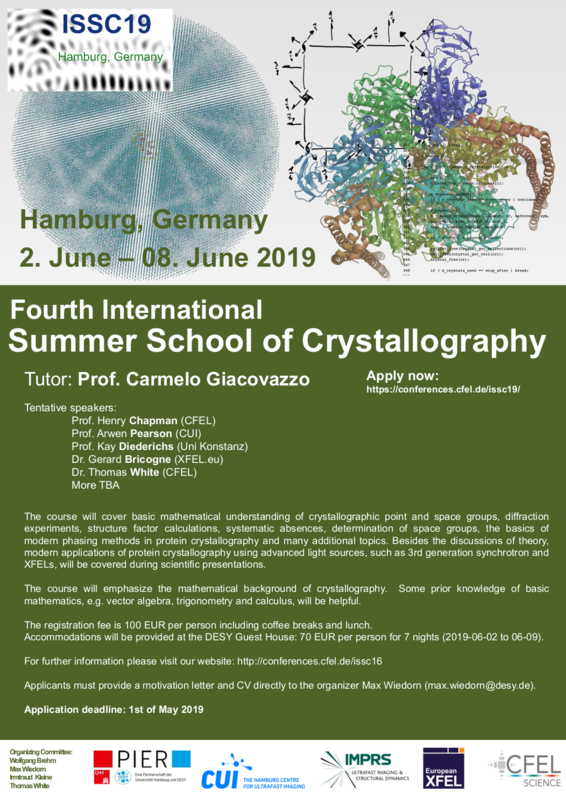 We are pleased to announce the forth International Summer School of Crystallography at the Center for Free-Electron Laser Science at DESY, Hamburg (D). Prof. Carmelo Giacovazzo will lecture on the basics of crystallography, covering mathematical understanding of crystallographic point and space groups, diffraction experiments, structure factor calculations, systematic absences, determination of space groups and many additional topics. Dr. Thomas Schneider will cover the background of phasing algorithms for structure determination of biomolecules. Participants will also learn modern applications and instrumentation of protein crystallography experiments at advanced light sources, such as 3rd generation synchrotron and XFELs. Besides the lessons there will be guided tours of PETRAIII/European XFEL, a BBQ and a trip to the elbe beach are scheduled. Accepted applicants will be asked to pay a registration fee of 100 EUR (includes coffee breaks). In addition, participants will have to pay for their own travel expenses, accommodation will cost 70 EUR at the DESY Guest House (rest will be covered by the school budget). Places and accommodation are limited to 30 students in total. Applicants must provide a motivation letter and a CV directly to the organizer Wolfgang Brehm.